Monday through Sunday, 11:30 a.m.-2 a.m. 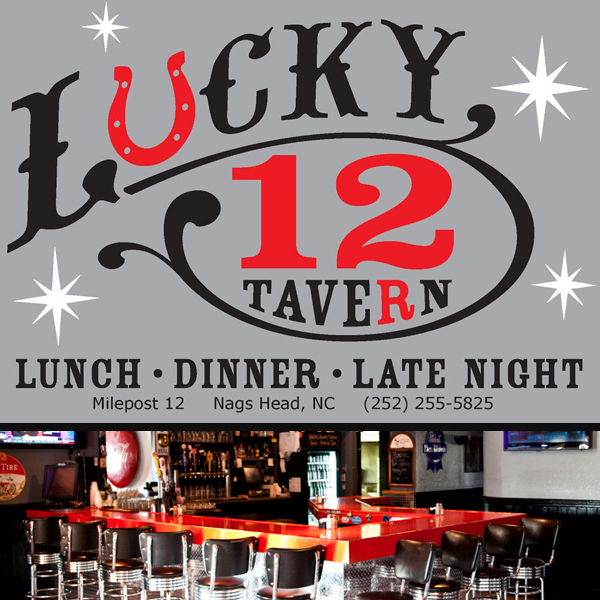 Established in 2006, Lucky 12 Tavern has become an icon to locals and visitors alike. The Outer Banks sports bar and restaurant, located at milepost 11.5 on the beach road in Nags Head, has something for everyone! A kids menu and old-school arcade games for your little ones, 20 TVs with sports galore, a late night pizza menu and a phenomenal selection of draft and craft beers are just a few things Lucky 12 Tavern has to offer. We also have an outdoor patio, a pool table, pinball and a jukebox. Whether you’re here for the food, beer, sports, or all three, you’ll be thrilled by the array of options available. Our affordable dinner menu features local seafood and produce, hand-pattied burgers, New York-style pizza, Philly cheesesteaks, creative salads, amazing wings and boardwalk fries, among other things. If it’s a game you’re looking to catch, there’s a strong chance it’ll be playing here. Our sports packages include ESPN College Extra, the Big 10 and SEC networks, NFL Sunday Ticket, MLB Extra Innings and NHL Center Ice. Beer lovers, don’t forget to breathe once you see our 20 taps and refrigerator full of over 90 bottles and cans. If beer isn't your style, have us serve up your signature cocktail, or order a drink from our wine and martini lists. Owner Mark Ballog wanted to create a place where every lawyer, teacher, tourist, sports fan, college kid, senior citizen, cougar, bachelorette, biker or general heathen could feel at home, and boy, did he succeed! Stop by for what you like, then stay awhile. Informal, family dining. Great for drinks and late night dining.